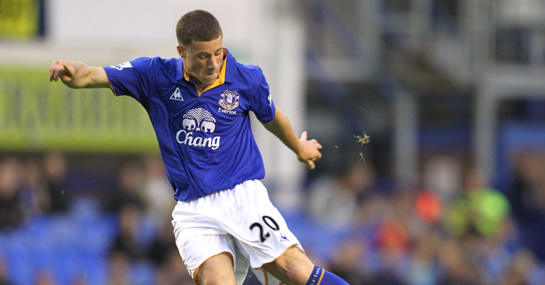 Chelsea boss Andres Villas-Boas is ready to launch a huge £20million bid for Everton teenager Ross Barkley this January. With Frank Lampard the wrong side of 30, Villas-Boas is desperate to build for the future and, according to the Daily Mirror, the Portuguese has followed the lead of David Moyes and identified the 17-year-old as a star of the future. The Blues made a tentative approach for the midfielder in the summer but are now prepared to go back and offer cash-strapped Everton the huge fee. Manchester United are also thought to be sniffing around and, following the success of a teenage Wayne Rooney’s move from Everton to United, they will also be keen to bag the player. It would be a blow to Everton in footballing terms but, with easing their precarious financial situation a priority, the offer of a big pay day could prove too much to resist. Meanwhile, Chelsea’s hunt for silverware continues tomorrow evening with a Carling Cup clash against Fulham at Stamford Bridge. The Carling Cup was the first trophy Jose Mourinho won with Chelsea and Villas-Boas will be keen to emulate his mentor. Fulham haven’t beaten Chelsea at Stamford Bridge since a old division two clash all the way back in 1979 and the Cottagers will have their work cut out to get anything out of the game. Martin Jol’s side are without a win in six games and have yet to win a game in domestic competition this term. Backing Chelsea to come through this one in 90 minutes looks like a very decent bet at 3/1.